17th July 2009, marks the date that changed my life after more than 10 years of blurred vision. I had been wearing glasses since I was in Primary 6 and from then, my near-sightedness became increasingly worse. I have changed glasses after glasses, I can still remember my first pair of glasses were made out of plastic and have the resemblence of the one that Harry Potter uses! Slowly, my fashion sense became better as I grow older, I start to go for semi-framed glasses, then finally frameless glasses and into sunglasses design. Contact lens too was part of my life during Secondary 4. I used to dread the idea of stucking something into my eyes and wearing it till it dries them out. But I got used to it, because of vanity. I want to look better without being "four-eyed". Whenever I go for sports, my favourite include swimming and martial arts, I would face the difficulty of seeing things clearly for I was force to remove my glasses so that I can put on my goggles for the former and avoid being crushed for the latter. And now that I am pursuing dentistry, I would require to don a face mask and the problem with face mask is that, whenever you breathe, the water vapour will rise from the mask and fog up your glasses! So, I have to stop intermittently whenever I'm doing something. And so I made up my mind, to get my eyes fixed for good. No more glasses, no more contact lens, I am going for LASIK. I had had LASIK in mind for quite sometime already. It was in 2008, that I stumbled across a booth fair in my own campus for LASIK and the price caught my attention. Before this, I thought LASIK was very very expensive and I wouldn't afford it until I begin to earn enough when I start to work, which will be forever! But it wasn't so. This particular centre was offering LASIK for the price of RM2,888 for both eyes! Now, I'm not saying it is damn cheap but it is the cheapest in town, and I personally think it is very reasonable (not that I am filthy rich, NO!). Hey! Where else can you get prices like that now??? So..........at 5.30pm, I was at the centre (oh by the way, the place is called Advance Vision Eye Specialist Centre, the eye surgeon by the name of Dr Yeoh Phee Liang is a graduate from Royal College of Surgeons, Edinburgh. Check out their website if you are interested: http://www.advancevision.net.my/index.htm ), waiting anxiously to be called into the operation theatre. My vision was being checked and my cornea thinkness was being measured electronically just to be sure that the results were the same with the 1st checking I did last year. Then, they put on a surgical gown on me and a surgical cap too. Eye solutions which are local aneasthesia I suppose, were dropped into my eyes. My eyes went numb almost immediately. Then.....the operation begins! The operation theatre was simple enough, just a really long bed-like machine with laser at the top of the head rest area. As soon as I was being laid on it, my head was rotated towards the laser, directly underneath it. Now with both my eyes wide open, I was told to stare at a blinking red light, which is obviously the laser! Honestly, this is the most intimidating part. I mean, you know damn well that THAT red light is laser and you were asked to stare AT it! It's like asking you to step into a fire knowing damn well that the it will burn you alive! You get what I mean? I was scared man! 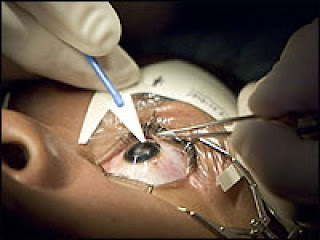 But the doctor warned me to NOT move a muscle as the initial step is the most crucial of the entire LASIK surgery. Finally, my eye was washed with isotonic solution and the doctor dropped some antibiotic into the completed eye before continueing with the other eye using the same procedures. The whole surgery lasted about 15 minutes and I was discharged after taking 2 paracetamol and closing my eyes for 5 minutes! My vision then was 50% cleared. Immediately after returning to my hostel, I tried to sleep because the anaesthetic was wearing off and I start to feel very uncomfortable and in fact, slight pain in both my eyes. They were slight bloodly liquid oozing out from the corner of my eyes. I took a sleeping pill that the doctor prescribed and had a 10-hour sleep, with protective eye shields on of course, for fear of rubbing my eyes when I am asleep. I don't intend to scare anyone with today's post. But I just couldn't resist the urge to blog about this after reading the newspaper this morning. Years ago, I stumbled across a little booklet, a Buddhist booklet to be exact. I can neither recall the name of the book now nor find it in my house. I remembered clearly that I'd read it before. It has a Buddhist monk in a sitted position with his index finger pointing up as though giving a warning as its cover image; the monk, obviously bald, was wearing a typical orange robe and no, no glasses.....oh wait, or maybe there was. Oh dear....*scratches head* Sigh.....just where in the world did I misplace it? Anyway, the booklet somehow mentioned that mankind will be inflicted with a disease more deadly than AIDS and cancer. He said that there would be a certain kind of air-borne Influenza that spreads from human to human through simple gestures like hand shake. At that point, I was of course, sceptical. "Pah!! Influenza is more deadly than AIDS??? How can a simple flu and cough kills a person?!" was what I was thinking then. But with the current pandemic A(H1N1) spread worldwide, I can't stop thinking that maybe this is what he meant. Is this the influenza he talks about in his book? Whatever he said, was it a prophercy? I don't know...... All I know is that the latest updates of H1N1 is worrisome. With more than 75,000 cases around the world (112 cases in Malaysia alone; while in Singapore 701 cases) and no way of slowing, if not stopping it; no doubt this is a call, a warning for mankind after Influenza H5N1 (a.k.a. Bird Flu) 6 years ago. 2. Perfect Cut 2 (13 episodes) ~ Yes! It's so good that there is a second season to it! Continue watching if you are hooked or can't have enough on the first one.